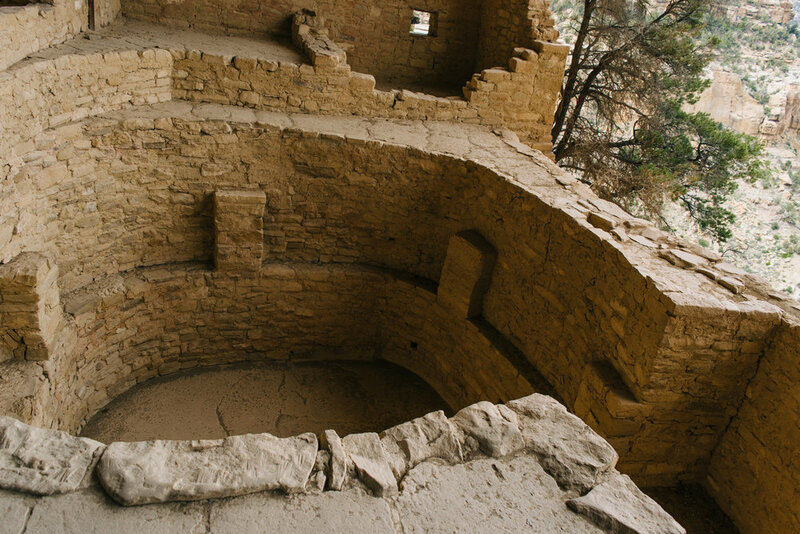 Mesa Verde National Park is, by far, one of the coolest places I have ever been, mostly because of the tour we took of Balcony House. When I started researching this trip, I realized that I would have to get a ranger tour in order to really see the cliff dwellings (since Spruce Treehouse is closed due to rock falls). Tours of all the dwellings aren't offered all the time, especially since we went in the off season, and we had to plan our trip carefully around the fact that Balcony House tours were going to take a break starting May 7. When we arrived at the park, the first thing we did was go to buy tickets for our tour. I'm glad we did because most of the time slots for Saturday had already sold out! We planned our entire day around our 3pm tour, and arrived to the meeting place 30 minutes early so we could take a quick nap before we began. Our ranger, David Nighteagle, began the tour with a general safety spiel. If you know me, you know these things tend to give me serious anxiety. When David mentioned, several times, that this tour was the "most adventurous" out of all the tours offered and that the only chance you have to back out is at the first ladder, I started to get really worried. Thankfully Logan wasn't worried at all (or, at least, told me he wasn't), and I swallowed my fear. We gathered at the top of 130+ steps and David explained a lot about the culture and asked us some general trivia questions about life for the Pueblo people. I knew the answer to a question about how they gathered water (thanks to stopping at all the pullouts and reading all the signs), and I got a sticker(!) and got to help with some demonstrations further into the tour. Basically, the National Park nerd in me was beyond excited! Me, helping with the demonstration. Sandstone makes up most of the cliffs in the park; this is a very porous rock and it soaks up any water that touches it. This water is pulled down by gravity, filtering through hundreds of feet of sandstone, until it hits shale - a denser rock that the water cannot go through. When it reaches the shale, it starts to push outwards, creating springs that the Pueblo Indians used to collect their water. The park used a large spring located at Spruce Treehouse for their main water source until the 1970s. The water is fresh and cold! After descending over 100 feet on stairs and walkways, we reached the first ladder. This ladder is 32 feet high - or THREE STORIES TALL! The park service does not allow people to go down ladders, so once you go put your feet on the bottom rungs you have to keep going. We were in the front of the group and I had to do a lot of mental preparation to get going. My legs started wobbling about halfway up and I did some internal chants of "YOU CAN DO THIS!" to make myself keep going. Plus, the couple in front of me was so slow that I had to keep stopping and just standing there...it did not help with the nerves. David boasted that he can get up the ladder in just over 6 seconds - his confidence (and the fact that he's been doing these tours for 21 years) helped me feel better about climbing up this thing. These pictures don't do justice as to how intimidatingly tall this ladder was. David was standing at the top of the ladder, offering his hand and lots of words of encouragement. We had to then walk through a narrow (probably 23 inches wide) opening to get to the first part of Balcony House. So glad I was at the front instead of having to go with a massive crowd! We waited for the whole group to come up so that we could hear more interesting stories from David. The first section of Balcony House is actually a food storage area, which they determined by the number of seeds and organic products they discovered when surveying this location. The ledge you see is actually why this is called "Balcony House." These balconies provided quick access from one upper level to the next (there were no ladders inside these buildings, just a floor/ceiling dividing the two levels) and are still structurally sound enough to hold people - almost 900 years later! This wall is incredible - it used to go from "floor" to "ceiling." It was built to protect the food from invaders - a lot of Indian massacres were taking place in this era, and Balcony House likely stored food for a few different dwellings, not just this one. Protecting the food from invaders was crucial to survival. From here we went through another two narrow tunnels (but we could still stand up in them) to get to get other side. The second side, towards the south, was the living side. Pueblo Indians built Kivas for each clan, so based off the two Kivas in Balcony House, archeologists determined that there were around 25 people living here. The first Kiva - this one is built correctly, but more on that below. Kivas are designed for ceremonies and living spaces in the winter. The pillars you can see along the walls serve as a base for the roof - the roofs were so structurally sound archeologists believe you could have driven a truck across them without them breaking. The Pueblo Indians used Utah-Juniper tree trunks and cemented it with a mixture of sand and water. You could even build fires on top! This Kiva is actually built incorrectly, but this perspective shows you some of the details. The "shelf" looking thing in the bottom is a deflector. There's a hole to let in fresh air, and the deflector prevents that air from hitting the fire pit and blowing the smoke all over the Kiva. The ledge at the bottom of this picture is supposed to be with the hole for air. They constructed it incorrectly and had to re-make it. After explaining the Kivas, David shared a little about his Native American faith and explained that he believes the spirits of the ancestors come back to where they lived regularly. He took out a flute that he hand carved and played a song to thank the ancestors for letting us visit their home. I didn't take any pictures of this moment because it felt private and like I was witnessing an incredibly special moment. I am so grateful we got David as our guide - he made the trip so much better and more meaningful to me. From there, we had to crawl through a series of tunnels, just 18 inches wide. Logan had to take his backpack off and wear it on his front to get through. The people who had baby carriers had to take those off, put their baby on top of it, and slide it through. CRAZY! We made it through the tunnels and the temperature was starting to drop and clouds were rolling in - it had been calling for rain when our tour started, but my good luck held it off until the very end. We still had two ladders and a RIDICULOUS set of stairs that had been carved into the cliff face by the CCC (this whole trail was built by the CCC, actually). The stairs were the scariest part of the entire tour - I had more trouble doing that than doing the 3 story ladder! And as afraid as I was about the stairs, I can't even imagine accessing these houses the way they used to - climbing straight down the cliff face with small toe and finger holds. Carrying children or food or supplies on your back. Absolutely unbelievable. Mentally preparing myself for yet another ladder. You can almost see me chanting "YOU CAN DO THIS" inside my head. Stuck below the slow people, yet again. This picture does not do the steepness justice. It's juuuuuust below a 90 degree angle and they're huge - and the poles were just barely too far apart for me to hold enough both of them. This is David Nighteagle (NOT Nighthawk or Nightowl). He is one of the kindest souls I have ever met, but also a SASSY old man. He came to Mesa Verde National Park when he was a junior in high school and fell in love with it - he told himself that he would come back to work. Sure enough, he's been working here for 21 years now. 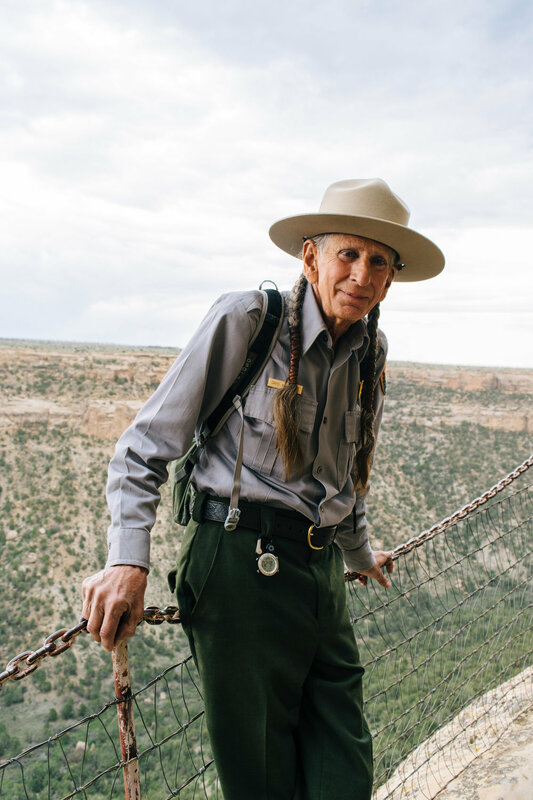 And at the ripe-old age of 68 is leading multiple tours a day and climbing 32 foot ladders and playing a flute he made and wearing deer-hide wraps in his braids. David made this trip for me - if you're ever in Mesa Verde and are trying to take a tour, ask which one David is leading, you won't be disappointed. Taking a tour of a cliff dwelling while you're in the park is a MUST-DO. There's a lot you can see of the park by yourself, but it's hard to beat getting this close to such an interesting way of life. The off-season tours are only $5, so there's no reason not to.